The preliminary tables from the CBMS 2015 surveys of U.S. departments of mathematics or statistics are now available from the CBMS homepage at CBMSweb.org or by clicking HERE. 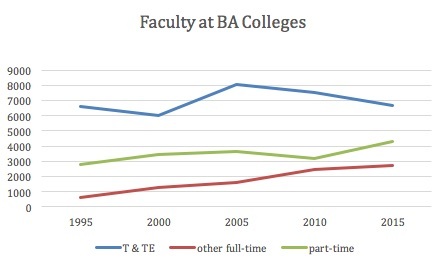 I am using this month’s column to highlight one of the most dramatic developments: the loss of tenured and tenure-eligible faculty (Figure 1). At the end of this article, I reflect on the implications for our profession. Figure 1. Number of faculty in mathematics departments. T & TE = tenured or tenure-eligible, other full-time includes post-docs. The year 2015 saw the fewest tenured or tenure-eligible faculty, 15,270, since 1995, a drop of two thousand positions since 2005. Where they have gone is no mystery. 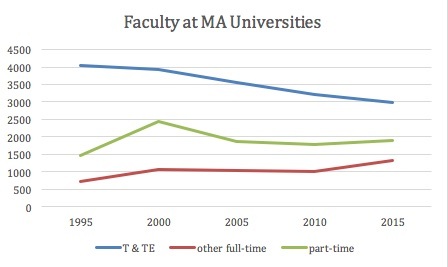 The number of other full-time faculty, including post-docs, has tripled over the past two decades, from 2140 in 1995 to 6427 in 2015. The break-down by type of institution—according to the highest degree offered by the mathematics department: PhD, Master’s, or Bachelor’s—is interesting. 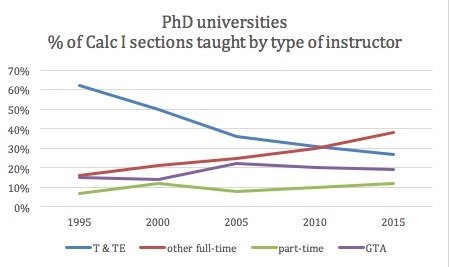 PhD-granting universities have seen remarkably constant numbers of tenure positions, Master’s universities have seen the greatest loss, and undergraduate colleges saw a spike around 2005 and have now returned to the number of positions in 1995. 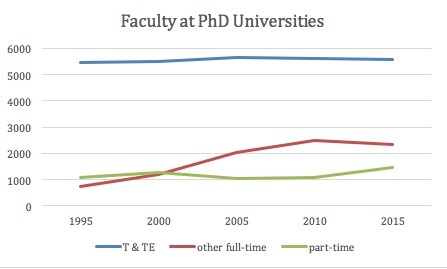 The growth in other full-time positions has been most dramatic at the PhD-granting universities, from 758 in 1995 to 2336 in 2015 (Figures 2–4). Figure 2. Distribution of faculty in PhD-granting mathematics departments. Figure 3. Distribution of faculty in Master’s-granting mathematics departments. Figure 4. Distribution of faculty in Bachelor’s-granting mathematics departments. It is not that we now have fewer students to teach. Since 2005, the number of students studying mathematics in four-year under undergraduate programs has grown from 1.6 to over 2.2 million, an increase of 38% (Figure 5). If we add in the statistics courses taught within mathematics departments, the number of students enrolled each fall has jumped from 1.79 to 2.53 million, almost three-quarters of a million additional students. This dramatic growth holds even when we restrict to students at the level of calculus instruction and above, where the past decade has seen an increase of 262,000 students (Figure 6). To meet this increased demand while dropping two thousand tenure positions, we have added over three thousand other full-time faculty and one thousand part-time faculty. Table 5. 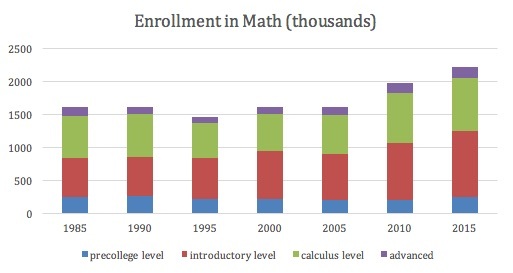 Undergraduate enrollment in mathematics in four-year programs. Calculus level includes sophomore-level differential equations, linear algebra, and discrete mathematics. 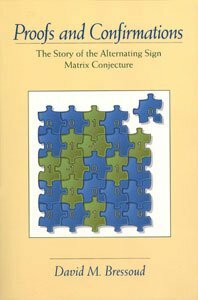 Advanced is any math course beyond calculus level. These do not include statistics. Table 6. 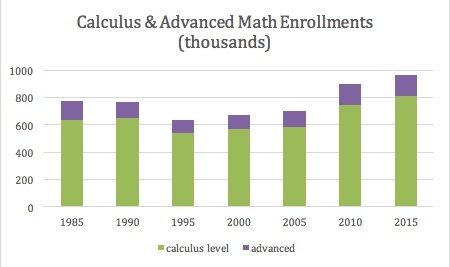 Undergraduate enrollment at calculus level and above. Not surprisingly, this means that undergraduate courses are now much less likely to be taught by a tenured or tenure-eligible faculty member. Figures 7 and 8 show what has happened at the PhD- granting universities. 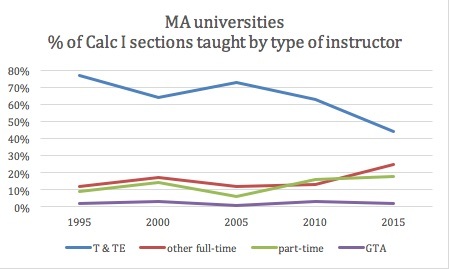 The 2015 survey was the first time that mainstream Calculus I and Calculus II were less likely to be taught by tenure line faculty than by other full-time faculty. Table 7. T &TE = tenured or tenure-eligible, other full-time includes post-docs. 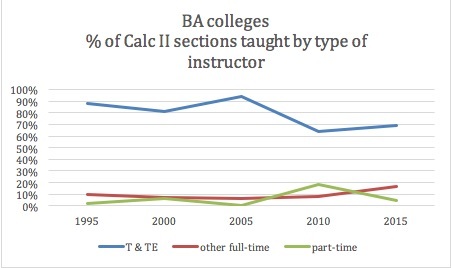 For 1995 and 2000, % is percentage of total students taking Calculus I. After 2000, it is the percentage of sections. Table 8. T & TE = tenured or tenure-eligible, other full-time includes post-docs. For 1995 and 2000, % is percentage of total students taking Calculus II. The trends are similar at Master’s universities and Bachelor’s colleges, though not as dramatic (Figures 9–12, following the Reflection). Reflection. The CBMS data confirm what I have seen in departments across the country, especially in PhD- and Masters-granting departments. More and more of the undergraduate instruction is now the responsibility of contract faculty. In our research universities, it is becoming unusual for a tenured faculty member to teach any undergraduate courses. 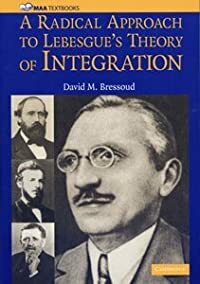 The unfortunate consequence is that the teacher-scholar, the ideal when I entered the profession, is fast disappearing. Those who are most active in mathematical research receive few teaching responsibilities. The remainder are saddled with heavy teaching loads that leave little time for research. 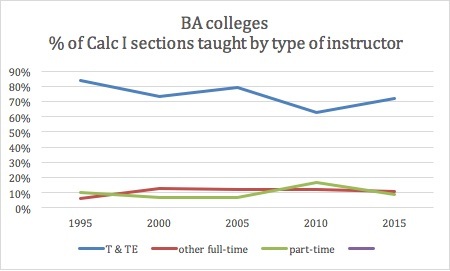 The reality of this bifurcation of the profession hit home in a recent network analysis of faculty interaction around issues of teaching, undertaken by the MAA’s Progress through Calculus project at a large public university. 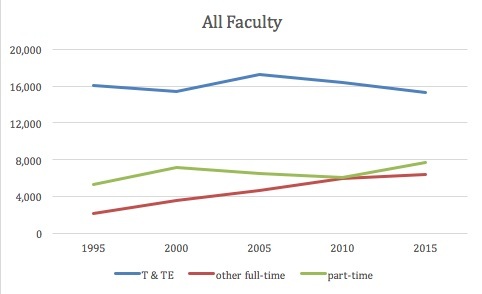 We found that tenure line faculty only interact with other tenure line faculty, contract faculty only with other contract faculty, with just a few individuals to provide a bridge. In effect, it has become two departments, one for undergraduate teaching and the other for research and the preparation of graduate students. The teaching faculty are now manifestly second-class members of the profession: earning less money and receiving fewer benefits, carrying heavier prescribed duties, often lacking input in departmental decision-making, and living with the reality that, even with a renewable contract, long-term prospects are uncertain. It is no wonder so many of them have chosen to unionize. There also are disturbing implications for the research faculty. Unlike Engineering or many of the other sciences, tenured mathematics faculty members seldom receive research grants that cover the full cost of their employment. Our public research universities have justified the size of their departments of mathematics by the large load of service teaching these departments must provide. Administrators are already questioning the wisdom of supporting a large corps of mathematics researchers who contribute ever less to the activities that pay the university’s bills. 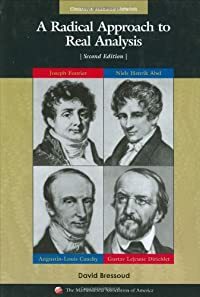 We cannot turn back the clock, but there are mechanisms that can mitigate the dangers: involving contract faculty in departmental committees and decision making, involving tenure line faculty in observing and supporting those who carry the brunt of the teaching responsibilities, and ensuring that everyone is respected. There was one simple action that I observed at the Colorado School of Mines, a PhD-granting department. On the bulletin board that posts pictures of the faculty, contract faculty were not segregated from tenure line faculty. All members of the faculty were together in alphabetical order. What a radical idea. Table 9. T & TE = tenured or tenure-eligible, other full-time includes post-docs. Table 10. T & TE = tenured or tenure-eligible, other full-time includes post-docs. Table 11. T & TE = tenured or tenure-eligible, other full-time includes post-docs. Table 12. T & TE = tenured or tenure-eligible, other full-time includes post-docs. **Editorial note: Figures 1-4 were updated on October 27, 2017.